"Hats off", is what i'd say to Praga Khan. Quite an accomplishment, what they're doing (insert here a refrain that is beginning to get quite boring on how in god's name it is possible that a group with such a status in the States is so underrated over here). That recognition obviously is a fact nowadays in our country, or how else would you qualify a band that can present their album on the roof of VTM, becomes 2nd in the album charts right after the release, is being spinned ad nauseaum by Studio Brussels and did more than their share of the honours as headliner of the first day of the rained-down Werchter-festival. Recognizition has happend, os again : "Hats Off". 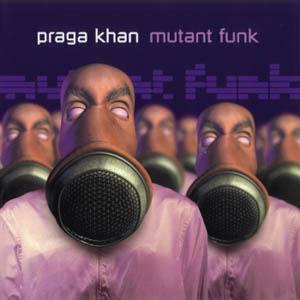 However : Three songs ... counting again ... yes only three songs on Mutant Funk sustain the impression that Praga Khan is an exciting band. They are called "Love", "The Power of the Flower" and "Sayonara Greetings". The first for it's really deep lyrics (vb. A rock guitar, a candy barr, CD Rom, Atom Bomb, Silverwear, Teddy bear, Rocking chair, rasta hair, Superman, Peter Pan, U.F.O., Radio, Excorcists, Paper Clips, Bubble gum and laser guns ... but all you need is love : some thought went into this! ), the second for its drive and nice psychedelic touch, and the third for the memories of days-gone-by that it stirs (Bowie in a Sisters of Mercy song in a Killing Joke sauce by an EBM band). Everything else on Mutant Funk is trying very hard to be very pleasant audio-filling. Muzak for the techno generation. Of course the beat doesn't halt, and there are enough studio tricks in it to make a magician envious .. but a strong melody, a grain of excitement or emotion, or just something that keeps you from dozing away ... nowhere to be found. So instead of "Hats Off", Praga Khan threw their hat at it (in dutch the expression "throw your hat at it" means "try casually, without giving it a lot of effort"). What saves the day for this release is that it comes with a second CD that's chockfull of video's and remixes of the best songs of "21st century skin", a record that does justify the current status of Praga Khan in this here Low Countries. - TEEK-magazine : "The "mutated funk" of Maurice Engelen and Oliver Adams is, despite its psychedelic popinfluences, only half-and-half convincing. The dancejunk that has Underworld on his cd-shelf won't get a thrill out of this." - Dirk Steenhaut in Metro (De Morgen) : "On Mutant Funk he mixes techno with rock, combines electronische machines with guitars and winks at Bowie, Fad Gadget and Depeche Mode. Stirring, but fortunately not overstrained". - Stijn Lauwers in De Standaard : "... a surprsing roadmovie-soundtrack with psychedelische songs ... (from which) you could easily extract at lease six potential singles. "Meditation" stands the comparison with the best of Underworld doorstaan and the Sisters Of Mercy-pastiche "Sayonara greetings'' seems like it was taken from David Bowie's Tin Machine." - webzine 6Bears "Olivier Adams... nous d�verse ici 12 partitions qui mettront vos lecteurs de CD � dure contribution. Entre un son proche des Cure sur "Sayonara Greetings", plus Pet Shop Boys avec "Meditation" ou encore de l'acid house bien puls�e comme sur "The Moon","Mutant funk " fera certainement les belles nuits de toutes les raves dignes de ce nom aussi bien en Belgique que partout ailleurs." - Out Soon (Café Cool): "'Mutant Funk' is a stong successor to '21st Century Skin': we get joyous electro-house such as 'The Power Of The Flower' or 'Turn Me On', next to more subtle work such as 'Dreamcatcher'. Moments of elektronic self-reflection next to well-aimed floorfillers." - SvS in Rif-Raf : "Does it surprise you that we don't get excited at all about "Mutant Funk", an album on which Praga Khan does what Underworld did better on their far from brilliant last album. Is it pretentious to state that their elektronic sounds sound outdated? Don't think so, or can't you expect some evolution by a band?" You can order this CD from a number of locations (prices researched for the limited edition double CD on August 16, 2000, but nothing guarantees they still are the same when you read this).